I bought my G1023 3 years ago. Since then it has seen a lot of action. First and foremost this saw cuts straight and true. Everything I ever asked it to do, it did without complaining. I only got the G1023 to bog down once by pinching the blade with plywood. On some thicker pieces cutting got slow, but was still possible. I would not worry about the motor or the saw's power. The saw may be too slow for production, but a hobbyist will find all the power he needs. When not under load the motor produces that beautiful hum a finely tuned table saw should have. There are no vibrations anywhere on the saw. The table top is flat as far as I can tell. My straight edge hugs it perfectly. I did not have a feeler gauge small enough to squeeze under the straight edge. The tilt and blade high mechanism is precise and without play. The blade can be set to and locked down at any angle required. The angle gauge on the cabinet next to the hand wheels is practically useless. It is, at best, accurate to the degree. That's not good enough for me.I measure digitally to the 1/10th of a degree. My saw did not arrive perfectly tuned. That's practically impossible considering that assembly requires bolting the top onto the cabinet. After going through the required table saw tuning steps, I produced a setup with a practically dead on arbor and blade runout of less than 0.0002". Not too bad. Over the years I have repeatedly check all tolerances. The saw required only minor retuning so far. The saw comes with a absolutely useless separator with a plastic blade guard. The separator does not move with the blade and needs to be removed for dado cuts. The anti kickback fingers are so powerful they mar soft wood like polar on the way through the saw. This is a feature you will probably not use. The new version of the saw come with a riving knife, which eliminates all the problems the older models have. The two stock throat plates are very poorly designed. They leave too much of a gap between the blade and the table surface. Zero clearance inserts are the way to go anyways, so this is not a real negative for the saw. The Biesemeyer clone fence on my saw stays truly parallel to the blade when locked down. I measured less then 0.0003" runout using the miter slots as a base. The fence moves easily and locks down securely.There is no fine adjustment, which makes dialing in precise fractions very hard. I find myself tapping the fence with my fist. The built in measuring tape is useless. When I use it to position the fence I can only get within an 1/8th of an inch of my intended setting. That's completely unacceptable. If you buy this machine, plan on measuring the distance from the blade to the fence some other way. The Wixey digital fence has solved this problem for me. I would replace any stock tape with the Wixey. Dust collection on the saw is so so. There is no dust shroud around the blade and there is no above-the-blade collection unit. The cabinet comes with a cutout for the dust collection hose, but no dust port. My machine also did not come with motor shroud, which I had to buy as an add-on. After sealing the cabinet and installing a dust port, below the blade collection is adequate, but not perfect. The saw still kicks up a good amount of dust into the air. A saw blade collection unit will probably take care of this. Overall the G1023 is a capable, but basic unit. It will perform anything a hobbyist will require. All parts are machined well, and appear to be built to last. After some tuning the saw produces perfect cuts. I recommend hobbyists to skip the contractor style saws and go right for a model comparable to the G1023. 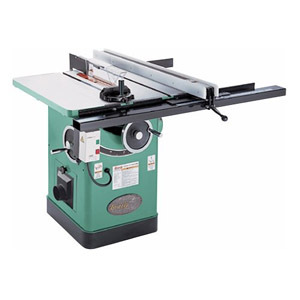 The machine is much more capable than a contractor saw and will last you a decade into your woodworking career. Who knows, it might be the only table saw you'll ever need. Note: Beware the missing motor cover. After you add tune ups to this saw, this will be more expensive than the model with the longer fence. Buying the better model now saves money, at least in this case. Max cut depth 3 1/8"